Apologies to the numerous participants in the ‘Japanese Literature Challenge’ who have already reviewed Ms. Ogawa’s book for not reading your comments yet; I wanted to come to this book with a clear mind, and I promise that I’ll read all the other reviews once this has been posted. Well, fairly soon afterwards anyway (family duties permitting, I’m a very busy person, you know). Anyway, my second book in recent weeks with a housekeeper at the centre of the tale was slightly less murderous than the first, but just as well constructed. 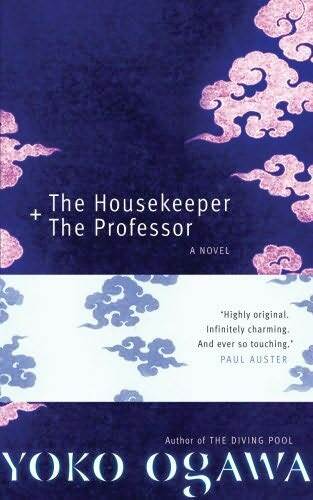 Ogawa’s short novel tells the tale of a housekeeper employed to clean up for a mathematics professor who lost his long-term memory after a car crash. The housekeeper’s son, whom the Professor nicknames ‘Root’ as his head is flat like the square root sign (and with whom I share a birthday! ), strikes up an unlikely friendship with the old man, and in the course of the 11 chapters, spread over 180 pages, the three of them form a strange kind of family unit. One of the things which bind Root and the Professor together is baseball, a sport which is especially fond of numbers and statistics. With his memory stuck firmly in 1975, the Professor frequently asks about his favourite player, Enatsu (a legendary pitcher who wore the perfect number 28 on his back). Through white lies and evasive tactics, Root and his mother share their hobby with the professor without alerting him to the fact that the times he remembers have long passed. In this rather sparse work, Ogawa looks at the theme of family, in particular what makes a family. Root’s eager adoption of the Professor as a friend can be traced back to the absence of a father figure in his life, and the Housekeeper may also be looking for someone to fill this role. In the film version, there is apparently a stronger sense of attachment to the Professor shown by the Housekeeper, but in the novel this is more implicit than described. The role of mathematics is also important in this book as it serves as a metaphor for the situations the characters find themselves in. The Professor tells the Housekeeper that numbers underpin and support the real world; however, knowing this does not help you to understand that world. The Housekeeper realises the truth of this when going about her daily chores; knowing that the serial number of a fridge is a prime number will not stop the ice-cream inside from melting… In another example, the Professor explains how important triangles are to the complex formulae of further mathematics – a further parallel to the triangle of characters at the forefront of this story. But what’ so special about 62 you may ask? My goodness. You were the right one to review this book on math! But I disagree about the Housekeeper. Part of the charm of the book is the subtleness of her relationship with the professor. Spelling thing out would ruin the book, I think. I do think tho that she is unusually clever in picking up the significance of math so quickly and unusually patient with the professor. I'm sure glad you can explain the Math part of this book; ever true to my nonmathematical nature, it went completely over my head. I thought, "Oh, head flat = square root sign" and that's about as far as I got. But, I like what you said about "numbers underpin and support the real world; however, knowing this does not help you to understand that world", and then you went on to give important examples. That was an enlightening point of the book to me, which just goes to show that reading one another's reviews is ever helpful. Thanks. Thanks for offering a little different perspective on this book. It's already on my wish list and I hope to read it for the Japanese Lit Challenge later this fall. I really enjoyed your review on this. I hadn't even noticed the significance of triangles to this story! I'm also totally delighted by your equation at the end. I was more comfortable with the sparseness, but I think that's becuase of my personality. 🙂 HA–you found something significant–the Professor would be proud! Love the equation, Tony, and the thoughtfulness of the review. The maths didn't come across as gimmicky to me but I can see how it could be perceived that way; what works for one reader won't necessarily work for another. I appreciated its spareness, brevity and subtlety. I stumbled across your Patrick White review as I was looking for this. It sounds as though I'd enjoy that one a lot more than this one. Certainly a very… different beast to this book anyway!